“Gloria Vanderbilt is still living a most remarkable life, which has included the headline-making battle royale over her custody when she was 9, multiple marriages, wealth beyond measure, ruling a fashion empire built on designer jeans, suffering the losses of her greatest love and one of her sons, and now being known as much for being Anderson Cooper’s mother as for the rest of her astounding biography. At 92, she appears in Liz Garbus’ enthralling new documentary without makeup and somewhat without artifice. She is, as her snowy-haired son says, “the last person in my family alive, the last person who knew me as a child, so I don’t want there to be anything left unsaid.” — San Francisco Chronicle. 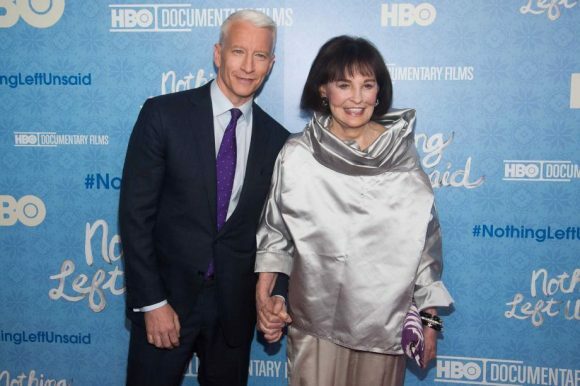 “Liz Garbus’ Nothing Left Unsaid: Gloria Vanderbilt & Anderson Cooper is an entertaining overview of the famed heiress’ colourful history to date, drawing on an extensive trove of archival materials and the subject’s own testimony. Casting her as a brave survivor of numerous travails, this glossy, somewhat superfluous recap of an already much-examined life leaves one question unasked: Would there be any pressing reason to care about their personal hardships if these protagonists weren’t longtime celebrities?” — Variety. “Oscar nominee Liz Garbus (What Happened, Miss Simone?) explores the relationship between the wealthy icon and her son, the CNN newsman. The documentary is set up as a conversation, but it’s more accurate to say that it puts Cooper in his accustomed role as interviewer. He tackles the job with gentle persistence. When the subject matter is your own mother, a woman who has led a wild and colourful life, there are undoubtedly going to be revealing moments and emotions … While an occasionally revealing portrait, Nothing Left Unsaid doesn’t strive for anything concrete. There is a nostalgic wistfulness to it..” — LA Daily News. “It simply falls victim to a natural kind of familial self-regard, a belief that the bonds shared by us and our parents and siblings and aunts and grandparents are uniquely special. In many ways they are, of course. But even a family as mighty and storied as the Vanderbilts can be, well, a little common, a fact made plain in some of Nothing Left Unsaid’s duller, more narcissistic moments. Gloria Vanderbilt has had a strange, remarkable life, but Garbus’s film only plays the hits with a soft pedal, giving the family the gauzy, bittersweet photo album they asked for, instead of the incisive, enthralling saga of American wealth, access, and ingenuity Nothing Left Unsaid possibly could have been.” — Vanity Fair. I can’t see this listed for tomorrow? Thanks for pointing that out, Clint. Sky has just confirmed there was a scheduling error and apologises for not sending media a programming amendment. Nothing Left Unsaid will now air June 29 and Suited tonight.